High conversion rates are the heart of most PPC advertising campaigns. While some campaigns focus on clicks or impressions, making a profit is always the end goal for businesses undertaking any marketing endeavour. Generating positive conversion rates for a reasonable cost is a main concern for many PPC advertisers. Google made an astonishing $79.4 billion off advertisers last year, which represents a significant investment by companies on the platform. The average conversion rate for AdWords is 2.70%, yet the top advertisers in the industry are able to generate conversion rates of up to 11%. That is a major gap between the best advertisers and everyone else. It is, therefore, well worth investing in AdWords but savvy PPC marketers, advertisers and business owners will always be on the lookout for techniques to boost their conversion rates. Increasing your conversion rates is all about implementing the right strategy for your company and following through with quality decisions. From choosing the right campaign goals, the right conversion tracking and bidding strategies to the right audience and platforms, there is a lot to think about when it comes to AdWords strategies. This is just the tip of the iceberg when it comes to the core, multi-layered PPC advertising strategies for AdWords. However, even if you are very familiar with these core strategies, there are many more lesser knowns tips and tricks which can really make a difference to your conversion rates. With just a few easy to implement PPC hacks, you can refine your campaigns even further and scoop up some extra conversions along the way. By understanding the following, often overlooked PPC hacks, you can gain an extra edge for your conversion rates. Most advertisers know to segment AdGroups by keyword topic but they may not realise that the smaller the AdGroup the better. As more experienced PPC marketers will know, what AdWords recommends is not always the best way forward. The problem with having so many keywords in an AdGroup is that you can never have all of them perfectly match your ad copy. Among 20 keywords there will inevitably be substantial variation in meaning. Smart advertisers are well aware that relevancy is the most important factor in generating conversions and having too many keywords in an AdGroup will decrease relevancy between the search query and the ad copy. There is a lot of range present even within this narrow topic. If we imagine we are the user searching for a ‘brown sugar pecan pie recipe’ we could end up seeing an ad that is only somewhat relevant. If the user is feeling generous, lazy or desperate they will still click through to read your recipes and hopefully find one they are happy with. Wouldn’t it be much better if they found the exact recipe they were looking for straight away? By segmenting your keywords into very small AdGroups, you can boost keyword to ad relevance ten-fold and users will have a better experience of your ads. This could be the result of a poor negative keyword list or having too many keywords with different meanings in the same AdGroup. This doesn’t mean you must limit your keywords list, just take the time and effort to build them out into more AdGroups. It is best to start out with a high ad variant to keyword ratio. This means having a very small handful of similar keywords with the same meanings and several ad variations to test in an AdGroup. For advertisers with large keyword lists, you may be dreading having to build out so many AdGroups and find the process tedious, however this simple PPC hack can make a big difference. High level segregation produces high relevancy and more insightful data, so the more you segment the better data you acquire and the more accurate your targeting. You can separate AdGroups by keyword topic, meaning, long tail vs short tail, intent level, match type and more. Klientboost goes so far as to recommend SKAGs or single keyword ad groups. That’s right, one keyword per ad group. Now large businesses with many keywords may find this implausible but if you can get it down to as small as possible Ad Groups with similar meanings, you can increase CTR, conversion rate and create a better user experience. Better technology has taken demographic tracking and targeting to a new level. Gender and age are commonly used but income targeting is another option in PPC advertising. Income targeting is a great PPC hack which is, again, often overlooked in favour of other demographics but it can be very effective for certain advertisers. It adds an increased level of data and segmentation and is particularly effective when used in combination with other demographics to create an accurate buyer persona to reflect your target market. For high-end products like property, luxury holidays, boats and expensive jewellery income targeting is an especially helpful method. While high end earners are more frequently targeted, it can be used for a variety of income levels to profound effect, for example when targeting the right audience for business funding or bulk discounted items or perhaps you want to target young but high earners with a specific product developed for their needs and lifestyle. Advertisers can even launch multiple campaigns with different income targeting and adjust ad copy and keywords accordingly to reach a wider audience more successfully. By targeting only audiences who can afford your product it will increase your chances of conversion. 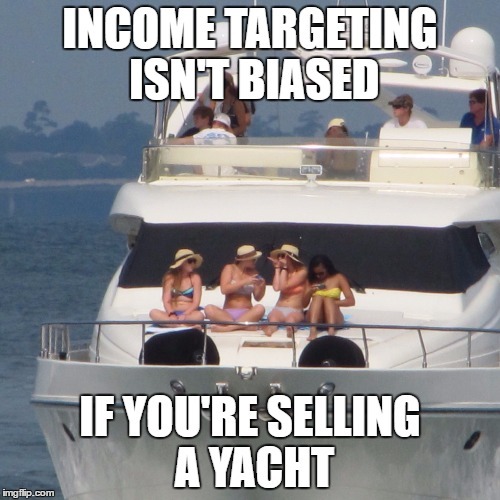 The main reason income targeting is often overlooked is because it is found in a separate section of your AdWords settings from other demographics. For some strange reason AdWords has placed income targeting with location targeting. To target audiences by income head to your settings tab and then locations. Then scroll down and select advanced search. Click the location groups tab. Now you can select demographics from the drop down. Finally, you can set you income targeting here. It may seem rather odd to hide income targeting within locations but there could be method in AdWords’ madness that actually helps your targeting and segmentation. Wealth and the value of income is proportional to the cost of living and this usually varies across a country and internationally. While someone living in a big city may earn more, the money does not go as far as someone earning the same amount but living in the rural countryside. The latter person is, in reality, wealthier, so using location and income targeting in combination could be very important, if income targeting is central to your PPC advertising. When employing this excellent PPC hack just remember not to remove potential customers based on misconceptions. Assumptions about your target markets’ income could be biased and people rarely follow a one size fits all rule. Most experienced PPC advertisers will be familiar with the concept of CRO for PPC landing pages and split testing landing pages to deliver the best results. One phenomenal strategy people often forget is deliberately designing different styles for landing pages to make the same product appeal to different audience types. Many products and services have a core demographic they appeal to but they also resonate with multiple demographics at substantial levels. Many advertisers develop various landing page styles for split testing but then end up only using one layout after it proves most popular. Advertisers should always review their demographic data in AdWords to see which kind of people are converting. If one demographic converts more than another, instead of just aggressively targeting them further, think about why other demographics are not converting. It could be the nature of the product or it could be how your landing page markets that product. By having different landing pages, aimed at different groups, you could grow your conversions across several demographics while still maintaining your core converting audience type. Consider the example of gaming companies. Their core demographic has long been men between 20 – 30 and marketing strategies are chosen to primarily appeal to this demographic. This includes PPC ads and landing pages. However, the reason young males are their core demographic has more to do with marketing methods than you might think. Now bearing this evidence in mind, gaming companies could still appeal to their core fans and increase their conversions with new demographics by using different landing pages. Choosing different language for your copy, focusing on different USPs and visuals can make a big difference to the type of audience who convert. If you are concerned that, despite using demographic targeting, you still have audience types reaching the wrong landing pages, landing themselves can be the solution. This way even if the audience saw the wrong ad and clicked through, the advertiser is still able to elegantly funnel them to a specifically designed landing page. This can work with different genders, ages, income levels, job titles and it can work for one product or service. Naturally some elements are universally preferred by all users, so be sure not to sacrifice common sense in the desire to cultivate landing pages for different audience types. Most landing pages should still maintain concise, unfussy design, easy language, clear directions and do not ask for too much information on forms. When using this hack in your PPC advertising never assume you know what styles different audiences will prefer, just because you are a member of that demographic. Leave your own bias at the door for the best results and use split testing in combination with separate designs for audience types. This hack should also help advertisers to not be hasty in disregarding certain audience types for their product or service. Don’t pause a campaign with a landing page and ad designed for one demographic if its doing badly. First try to figure out the cause. If the audience you expected to like your page is underperforming, perhaps you should open up the campaign to new audiences you did not anticipate. If you are serious about developing separate landing pages and strategies for different audiences, you can go even further than demographic segmentation. Don’t forget that in marketing you can segment by many criteria. In AdWords you will have already encountered demographic, geographic and behaviour targeting. Programmatic advertising takes behaviour targeting one step further but your strategy can also be segmented by known pain points, culture, occasion and even psychographic segmentation. Psychographic segmentation goes beyond basic demographic segmentation. It is very useful for advertisers to embrace this PPC hack, as it analyses the ‘why’ behind conversions not just the who. Asking who are my convertors is only part of the story. 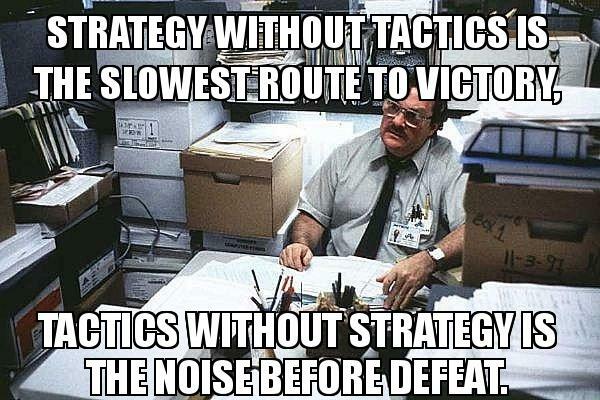 You will never truly understand what strategy will be best unless you know why they convert. Psychographic segmentation can help and you can then create accurate buyer personas and even better targeted multi landing pages. To implement the PPC hack of separate landing pages by buyer persona using psychographic assessment, you will need to do some work outside the AdWords platform. By sending surveys, asking the right questions in email marketing, analysing reviews and creating conversations on social media, you can discover why your convertors bought your product/service and what they like about it. Never assume that what you regard as your main USP is the reason people convert. People buy for different reasons and that is why using psychographic analysis before building your separate landing pages is such a handy tactic for boosting conversion rates. You may have noticed a subtle common theme in our previous PPC hacks: In PPC advertising and any marketing you should never make assumptions. Every marketer and business owner and even every person has confirmation bias and its damaging to all marketing strategies. Confirmation bias means we ignore data because of our own subjective beliefs. It seems silly to claim this is a prevalent problem, when nearly every blog we and all PPC experts write about contains the message of following data. The issue is that confirmation bias is harder to avoid that you might think. It is deeply inbuilt into human nature and must be actively resisted at every turn. Before the philosophy of the ancient world began to use logical thought experiments to test theories about the universe, people relied solely on inductive reasoning. This is when we base beliefs and opinions on our own experiences. It seems sound enough and it is nature’s method. It is how all animals learn e.g. don’t stick your hand in fire because it burns. However, with insufficient data we form narrow opinions e.g. once British people believed all swans were white. Every swan they had ever seen was white until black swans were discovered in Australia and New Zealand. They lacked the data required to reach the right knowledge. This age-old problem finds its way into marketing frequently. Business owners feel they know what their customers want and who their customers are, based on limited experience and usually unconscious bias based on their personalities, tastes and prejudices. An example of confirmation bias would be to assume only people in a certain income bracket will buy a product. However, consider a user doing research for a wealthier parent or boss to buy a product. You could miss out on converting them with confirmation bias excluding them from your target audience. By fighting our biased impulses and continually testing and gathering data, AdWords can reveal what really works. You would think in the wake of data like this the mind would shift but it often struggles. The problem is that some personal experience can be powerful in business. AdWords still rarely tells us why people do things. Hence, through years of business we form our opinions on what people like and why they buy even if we only have a small sample. However, the world is big and people are different. Ignoring campaign data can harm your strategy and make it hard to add scale. Fighting human bias and trusting data might be the most important PPC hack of them all. You can see confirmation bias affecting the world everywhere, such as the Facebook echo chamber. The trick to breaking free of confirmation bias is to remind yourself not to market to imaginary people. Use data to build buyer personas not assumptions and always accept you could be mistaken. Confirmation bias is so prevalent that in can affect the way we see data. Even if you are a PPC expert who takes following data very seriously, confirmation bias can make you see things that aren’t really there, such as coincidental correlations. Sometimes correlations exist for reasons we don’t understand and targeting these correlations can be beneficial but sometimes there are an illusion and there is no connection. Always be on guard to avoid confirmation bias and don’t drown out data evidence with opinions. Good reverse engineering is a vital component for continued AdWords success. It is a very simple AdWords hack and relies primarily on common sense but with so many AdWords tactics and functionality to think about these simple, common sense techniques become forgotten. Reverse engineering works in two ways. The first is in the building of your AdWords campaign. By considering your ultimate goal first and then planning each step of the campaign backwards you can ensure greater accuracy and relevancy. For example, you consider your objective is to generate profit. To accomplish this, you need more subscribers, as your items are highly priced and people rarely purchase straight away. So, lead generation is the subgoal and remarketing will likely play a factor. We then consider our audience and the landing page we will design for the goal, then the targeting for the campaign, then the ad copy and extensions and work back to our keywords. Every stage is planned meticulously for the end objective for hyper relevancy. As you can see reverse engineering campaign choice has a lot to with psychological analysis of each step on your conversion funnel. Can this company help me find it? What is special about this company? Why should I choose them? This format will help you better reverse engineer your campaign plan from a customer perspective. An important tripping point to be aware of is that customers may discover you at different stages in the funnel. They may already have heard of your company, are in a hurry, are sceptical etc. The second type of reverse engineering is re-creating your own success. Once you have a campaign that is working well and delivering conversions, you need to understand why, so you can reproduce the results. Once you understand the elements of your success you can reproduce it in many scenarios for various businesses. Again, following data carefully and psychographic analysis can often reveal the whys of your success for reverse and re-engineering purposes. A final handy tactic for PPC advertising is following the right KPIs when undertaking lead generation campaigns. While reverse engineering can reveal strong formats that can be used in a range of campaigns, advertisers may need to analyse different metrics when assessing campaign success. Focusing on the right or wrong metric can have an impact on your strategy. Optimising for ROI versus CPA, conversion rate or CPC can produce different results, so you need to be clear on your objective and its matching KPI. In a lead generation campaign, advertisers have more to think about. The conversion rate is not your real conversion rate, as they are only leads. You need to factor in the closing rate on those leads and this cannot be found in AdWords. This adds a layer of complexity, meaning many advertisers focus on conversion rates in lead generation campaigns rather than ROI. For e-commerce sites and many other direct sales focused campaigns, ROI is easily calculated. In fact, for e-commerce sites AdWords directly tells you your ROI. However, ROI is essential for assessing the long-term value of AdWords campaigns even for lead generation campaigns. It can provide much more important insights than conversion rates. Many businesses that choose lead generation tactics instead of conversions, do so because they have higher priced items or contract based services. These business models may experience a far more drawn out lead closure period (higher priced items) and differing conversion values for the same service (contract based services). In these cases, conversion rates are just not good enough to gauge campaign value. Particularly when conversions on the same service can have a different profit value, ROI must be the KPI of choice. A focus on conversion rates can lead you astray. By focusing on ROI and close rates you can place your budget behind the most profitable campaigns. Focusing on conversion rates could lead to more attention on the wrong campaigns because even if it gathers more leads they could close less often or have less profit value. ROI offers a bigger picture. PPC hero used ROI focused campaigns to improve lead generation for businesses with notoriously long closing windows and variable budgets. By focusing on ROI, they managed to increase revenue by 28% and return by 36% even though they supported a campaign with a higher CPA. This campaign had more closing leads. ln this perfect example form PPC hero, at first glance, we notice the spend on this year’s camp is higher, conversions are lower and CPA is higher. PPC marketers who don’t understand the full buyer cycle and the value of each variable lead could make a costly mistake here. They could assume that this year’s campaign is performing poorly compared to last year’s and therefore readjust the settings back to their former strategy. However, if they did understand the profits generated from each lead and which leads have closed, they would notice this year’s campaign is stronger. Look along the chart to qualification percent, MQL and cost per MQL. In this example MQL is market qualified leads so these are leads that actually became sales. We can see there are far more MQLs and a lower cost per qualified lead in this year’s campaign. To succeed in optimising for closed leads in AdWords for lead generation campaigns, advertisers must have a good line of communication open with their sales team. By employing the tactics in these 6 simple PPC advertising hacks you can further improve your core strategies and gain better conversion rates.